Last weekend was one of the craziest and most stressful in a while. As a part-time gig (as well as part-time obsession) I work for Major League Baseball, and after working a game at Wrigley on Friday night I volunteered to drive down to Milwaukee to work the next night. I am always up for seeing new ballparks, of course, and was excited about the opportunity. The only problem was, I had no idea the kind of time commitment I was making; I also ended up getting roped into working another game on Sunday. Long story short, I worked three baseball games in three nights, and drove a total of seven hours to do so. This left practically no time for homework, working out, or hanging out with friends, making me feel pretty guilty and horrible. I am a firm believer in the power of food to bring people together; I feel that there is no better time for a family to connect, a couple to reestablish their romantic bond, or a pair of friends to catch up than over a meal of some sort. This is probably one of the reasons why I get so much satisfaction out of cooking, because I know that I am, in some way, bringing people together with my food. In all of the craziness of last weekend I decided that I somehow had to figure out a time for my friends and I to get together for a meal (that “how” turned out to be at the expense of this week’s homework). So, this was our Sunday lunch. 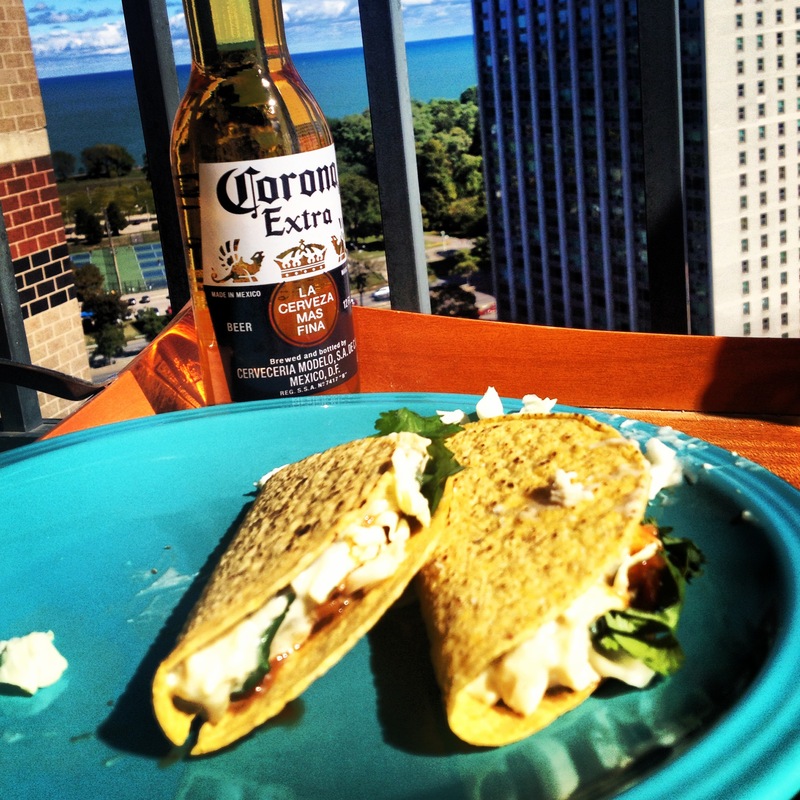 I prepared some easy and delicious shredded chicken tacos in a spicy cream sauce, which we enjoyed over a couple of beers along with the view from my balcony. The weather could not have been more beautiful; it was just what we needed to reconnect and decompress, and it made me glad that I had made the decision to set everything else aside for a little while. How lucky am I to have found some people in my life worth cooking through crazy for! Prepare the chicken to your preference. I grilled it on my Cuisinart Griddler and then shredded the chicken with two forks. If you prefer, cut it into bite-size pieces and sauté it in a pan with some olive oil. In a medium skillet, melt the butter. Whisk in the flour and cook for a minute or two. Slowly whisk in the chicken broth, constantly whisking to avoid lumps. Cook until it starts to thicken, a minute or two. Add in the cream cheese and stir until melted and combined. Stir in the green chiles. Add the chicken back in and stir to coat. Fill the taco shells with the chicken mixture and top with shredded lettuce, salsa, diced avocado and additional cilantro. 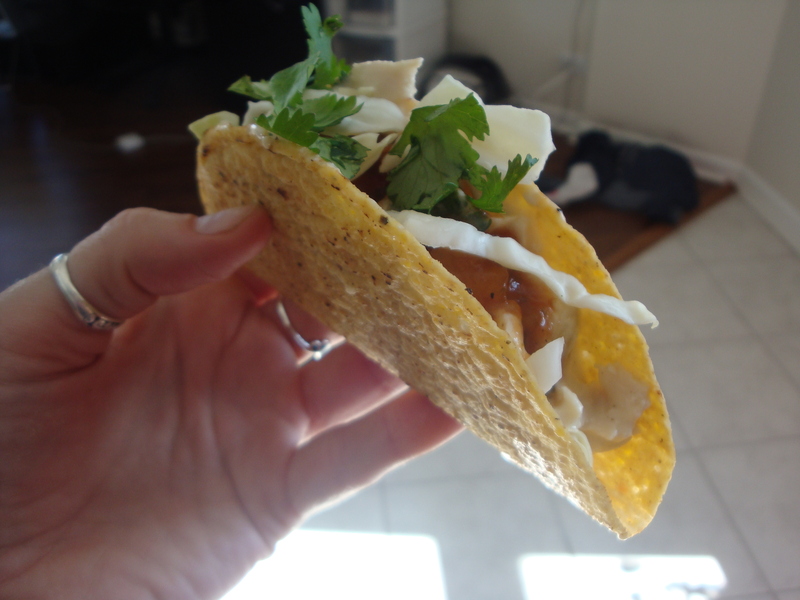 Posted on September 26, 2013 by Jilly G	• This entry was posted in Inspirational, Recipes and tagged beer, chicken, cilantro, green chile, inspiration, mexican, sunshine, tacos. Bookmark the permalink.